For a new exterior paint application to succeed, the siding must be cleaned and cleaned well— a job that can be pretty laborious if scrubbed by hand. A pressure washer offers a quick and easy way to get the job done, but they can be tricky to use on siding. If you arent' careful, the high water pressure makes it fairly easy to damage the siding or even cause water damage to the sheathing and wall cavities beneath the siding. While there are many advantages to cleaning your home's exterior before painting it‚ one virtue stands out above all others: Clean siding means your exterior paint will last longer. Although paint manufacturers might lead you to believe that the world will end if you don't clean the siding before painting, the reality is not quite that dire. The paint will go on just fine, but by painting dirty siding, you seriously shorten your paint's lifespan. Considering how hard and expensive it is to paint house exteriors, it's a good idea to get it right the first time. Rather than requiring a new paint job in 3 or 4 years, wouldn't you rather paint your house every 7 to 10 years? Invest the extra time in thoroughly cleaning the siding to boost the lifespan of your paint. There are certainly advantages to cleaning your house by hand prior to painting, if you have the time and energy. If you've ever taken your car through a touchless car wash, you know that washing without physical contact produces adequate, but never great, results. After a touchless wash, a white cloth wiped across the car may well still pick up dirt. The same holds true of washing your house's siding before painting—the very best results will be achieved by hand-washing with soap, water, and brushes. But realistically, it is very difficult and time-consuming to wash an entire house by hand, and a pressure washer can do an adequate job in a manner that is much, much easier. The point of pressure washing your house siding prior to painting is to wash it, not to strip the paint. True, most pressure washers are powerful enough to take off paint, but for best result, stripping should be a separate step done with a scraper, sander, or heat gun after the process of washing. Besides the dangers listed below, pressure washing simply isn't the most effective way to strip paint. In order to remove the paint by pressure-spraying, you need to inundate the base surface with massive amounts of water, which is never a good idea, especially with wood siding. Etching: Under certain conditions, pressure washers can cut into concrete and brick, so imagine the potential effect on cedar, vinyl, or even fiber-cement siding. This inadvertent etching is easy to avoid, though, if you simply stand well back when aiming your sprayer at the siding. Depending on your washer's PSI rating, this might mean anywhere from 18 inches to 6 feet away, minimum. Second, use a fan-spray nozzle, not a stream nozzle, which has a needle-sharp spray that can rip lines into the siding. Injecting: Be careful of spraying at low angles under the siding. The high pressure can drive water upwards between the siding boards and soak the sheathing and/or insulation of the wall interior. To prevent this, never spray at an upward angle to the siding—only perpendicular or slightly downward. Watch out for other openings, such as heating exhaust vents, air vents in the attic or crawlspace, and even cracks around windows and doors. Pressure washers come in both gas- and electric-powered models. Since you want to treat your siding gently, you won't need a high-powered gas washer; an electric one will suffice. A washer with a PSI rating of 1000 to 1500 is usually quite sufficient for washing siding. If you have a two-story house, a high-volume gas pressure washer fitted with a special nozzle will allow you to clean the upper areas while standing on solid ground. Make sure to use a cleaning solution made for siding, and avoid those that have bleach, which can damage the spray washer and kill plants. Where foundation shrubs or other plants are blocking the siding, protect them with sheets of plastic to prevent the pressure sprayer from stripping leaves off the plants. Damage to shrubs will rarely kill the plant, but it can disfigure it for the current growing season. Also, cover air conditioner compressors and other electrical utilities with sheets of plastic before pressure washing the siding. Using the pressure sprayer, rinse the siding with plain water (no cleaning solution), working from the top down. For this step, a wide spray angle and relatively low pressure should do the trick. Your goal is to knock down most of the visible debris: insect nests, leaves and the majority of the dirt. Let the siding dry. If your siding has areas that are discolored with mildew, mix up a batch consisting of 1 part bleach to 10 parts water, and sponge the solution onto these areas. A garden sprayer can also be used to apply the bleach solution. Be careful to avoid spilling bleach solution on shrubs and other landscape plants. No scrubbing is necessary; the bleach alone will kill the mildew. Complete this step when the siding is not in direct sunlight and winds are calm. Fill up your pressure washer's tank with cleaning solution, then spray the siding with the water-solution mixture, working from the bottom up. Use a low pressure and wide sprayer angle while applying the cleaning solution. Your pressure washer's instructions will indicate the proper settings for applying cleaning solution. Make horizontal passes along the siding, gradually moving upward but consistently using a slightly downward angle when spraying. A stepladder may assist here; move up a step or two with each pass so that you can continue pointing downward at the siding. Let the solution work for about 10 minutes, then rinse with fresh water from the top down. While cleaning should always done from the bottom up, rinsing should be done from the top down to prevent dirty water from running over the clean areas. Rinsing usually calls for a more powerful pressure setting and wide spray pattern, but again, make sure to follow the manufacturer's recommendations for the type of siding you have. Make sure to rinse thoroughly; this is where the major cleaning is done. To avoid damage, start rinsing with the nozzle held a fair distance from the siding, and gradually move closer. Back up again if you see any kind of damage occurring to the siding. If a couple of weeks pass before you can get to painting, an additional spray-down with fresh water is a good idea. It's surprising how fast spiders can move in and dust can settle after cleaning. Let everything dry for 48 hours before painting or until any bare wood is 100 percent dry. If you have valued shrubs and other landscape plants near your house, make sure to use a cleaning solution that does not contain bleach or other chemicals that might harm plants. It is best to test your sprayer on an unobtrusive section of siding, such as behind landscape plantings or the back of a garage. 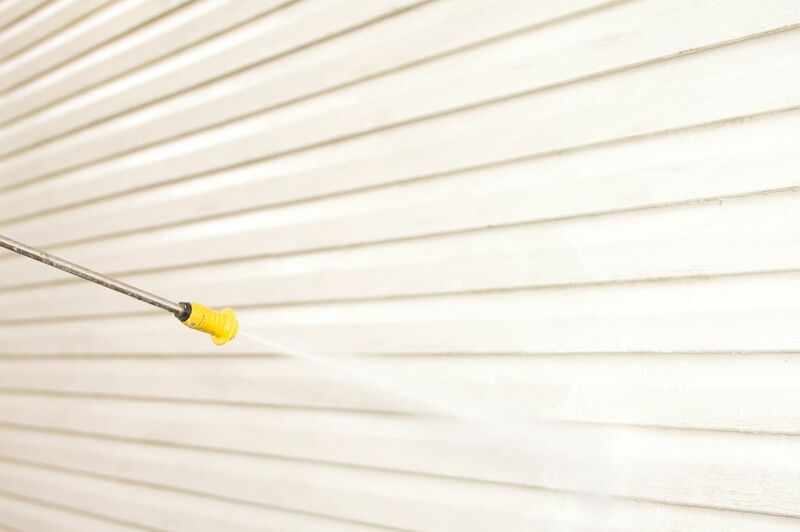 Used incorrectly, a pressure washer can damage wood siding or crack vinyl siding. Work in relatively small areas, rinsing, applying detergent, and rinsing each area before moving on to the next section. This will prevent the detergent from drying on the surface of the siding. An adequate pressure washer can be purchased for $150 to $250 dollars, or you can rent one for $50 to $75 per day. Once you learn how to use it, though, you may find many uses for the tool; buying one might be a good investment. Some pressure washers have rotating brushes that can be attached. This accessory can work well for siding that has thick layers of grime.